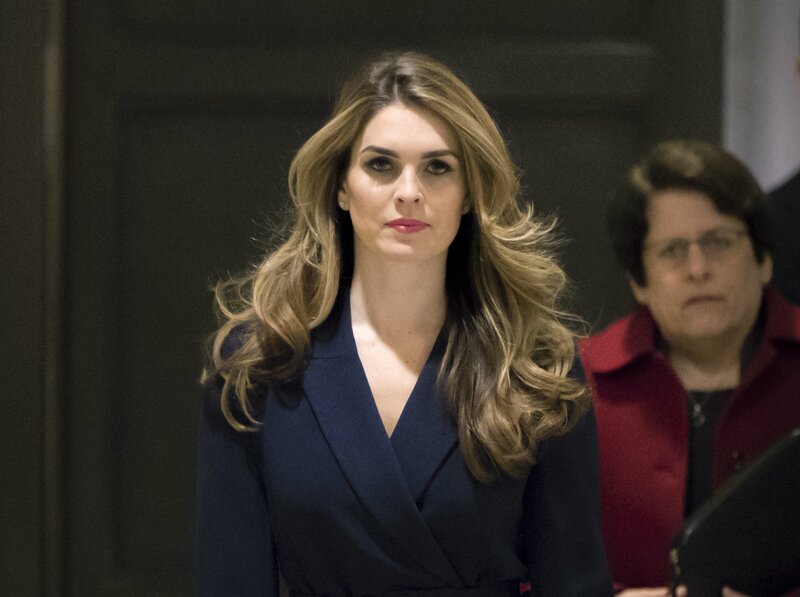 NEW YORK — President Donald Trump’s former spokeswoman Hope Hicks and former bodyguard Keith Schiller were interviewed by federal prosecutors last spring during their investigation of payments made to two women who claimed to have had affairs with Trump. A person familiar with the investigation told The Associated Press the interviews were done as part of the probe of Trump’s former lawyer, Michael Cohen, who pleaded guilty last summer to coordinating payments to Karen McDougal and Stormy Daniels in the weeks before the presidential election. The person, who was not authorized to discuss the probe and spoke on condition of anonymity, wouldn’t say what was learned from the interviews but described it as “routine” questioning that did not have a large impact on the case at the time or going forward. Neither Hicks nor Schiller were mentioned in court filings in which prosecutors laid out their case against Cohen, and neither has been accused of any wrongdoing. Prosecutors said Cohen, acting at Trump’s direction, had been involved in helping the parent company of the National Enquirer, American Media Inc., buy McDougal’s story for $150,000 and ensure it was never published. Cohen himself paid $130,000 to Daniels to buy her silence. Prosecutors said those payments amounted to illegal campaign contributions. The Wall Street Journal reported Wednesday that federal investigators spoke with Schiller because they learned he had made calls to American Media’s chief executive, David Pecker. The newspaper said investigators also asked Hicks, the former White House communications director, about her interactions with Pecker. Hicks, now at Fox, referred questions to her lawyer, Robert Trout, who declined to comment. Messages seeking comment were left for Schiller, who had the title of director of Oval Office operations, and a lawyer who has represented him. Pecker ultimately cooperated with the investigation. Prosecutors later revealed that by September, in exchange for that cooperation, the U.S. attorney’s office in Manhattan had agreed not to prosecute American Media. Trump Organization Chief Financial Officer Allen Weisselberg also cooperated with the investigation, doing so under a limited immunity agreement that prevents prosecutors from using any truthful statements against him in court. Cohen, who is set to report to prison May 6, has complained publicly about being the only person to face charges over the payments to McDougal and Daniels. He has testified before Congress that Trump had knowledge of both payments and signed off on checks intended to reimburse him. Trump has said the payments were a private matter unrelated to the campaign. As he was leaving the White House on Wednesday for a trip to Texas, Trump was asked whether he was aware of reports that investigators had spoken to Schiller and Hicks.